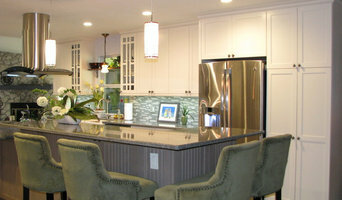 Your Local Residential Design Firm Specializing In Kitchen and Bath Renovations. From inspiration to realization Atlantic Interiors professional design teams will guide you through your residential project. Visit www.myatlanticinteriors.com for a comprehensive menu of products and services. *Authorized StarMark Cabinetry Dealer* Our expert designers at John's Appliance & Bedding have created hundreds of custom and semi-custom kitchens, and they are ready to make your dream kitchen a realty with a complimentary in-home design consultation! Our appliance and design showroom—the largest in Central Florida—is a one-stop shop for your kitchen remodeling needs, offering quality appliance & cabinet brands for every budget, small and large. Financing available. Central Kitchen and Bath has been a leader in Central Florida more than 20 years, quickly earning a reputation for providing a high level of design, products and service in an emerging market. Our showroom became known as the finest in Central Florida, an honor that holds true to this day. Rick Caccavello together with General Manager Paul Greenspan, work tirelessly to continue its reputation as the finest kitchen and bath design firm in the region. Rick believes that hard work, done with honesty and pride, at a fair price, using quality products and going the extra mile to please our clients is the only way to do business. Our trusted team of kitchen and bath professionals make it a priority to uphold those principals. Through the years, Central Kitchen and Bath has been highly regarded by home builders, remodelers, interior designers and other industry professionals, but what we value most is the relationships we have built with our clients and the confidence that they have in our ability to deliver on each and every project. Krista Agapito - S&W Kitchens, Inc.
Krista has been designing kitchens and baths for 18 years, thirteen of those with S & W Kitchens, where she is now the Director of Sales. She has a Bachelor of Arts degree from the University of Maryland Baltimore County. Signature Kitchens, a cabinetry design studio owned by husband and wife team Lee and Julie R. Collier, offers a range of product lines complementing a variety of design themes from Contemporary to Florida Craftsman. Each design is unique and the end result is a design that is an extension of the individual client, their home, and their lifestyle. A design philosophy that puts both form and function on equal footing ensures that the end result is not compromised. Signature Kitchens caters to both retail and the design trade. We invite you to visit our showroom showcasing Wood-Mode and other fine quality products. Chris Druschel - S&W Kitchens Inc. Kitchen And Bath Project Designer At S&W Kitchens, Winter Park, FL " Buy a House, And We Can Turn It Into Your Home"
Kristin Rutkowski, AKBD S & W Kitchens, Inc.
Kristin is a National Kitchen and Bath Association (NKBA) certified Designer and has been working in the industry in the Central Florida area for over 9 years. She received her Associates of Science in Kitchen and Bath Design from Seminole State College and a Bachelor's in Theater and Communications from The University of Central Florida. "The most rewarding part of what I do is working one-on-one with clients to help their vision become a reality. It is truly exciting to have a client thank me because the final product is everything they wanted." A Design Alliance , Inc.
Jaime has been designing kitchens, bathrooms, outdoor kitchens, and other spaces since 1992 in Central Florida. He strives to educate his clients with the latest products and solutions. "Our industry is changing so rapidly these days. There are many different ideas and new products that are coming out every day. I enjoy educating the client on the ones that make their space AMAZING for them".- Jaime studied business at Valencia and Seminole Community Colleges, has studied in various NKBA courses, and regularly attends many product manufacturer training's to really understand the products he is recommending. Matt Carpenter - S&W Kitchens, Inc.
Matt has 19 years of experience in the custom cabinet design profession in Orlando, FL. He enjoys working closely alongside homeowners, and their esteemed interior designers & builders to create custom cabinet designs for Orlando luxury homes. Matt likes to help clients think “outside the box” with his hand sketches to enhance the artistry in their designs, while also carefully considering excellent functionality! Located in St. Augustine, we are your premier kitchen and bath remodelers. Our job is to help the vision for your house become a reality. In each job, we are dedicated to satisfying our customers with beautiful, long-lasting kitchens and baths. We specialize in custom kitchen & bath designers and custom home builders. We are happy to visit your home and provide you with a free estimate and design. What does an Ormond Beach kitchen designer or bathroom designer do? A kitchen and bath design professional in Ormond Beach, FL knows to take all of these crucial points into consideration and can help plan the layout, materials and overall look and feel of either of these rooms in your home. Kitchen designers, as well as bathroom designers, are constantly staying on top of trends in the ever-changing industry. The designer also knows the best layout for your room, and can configure the layout for optimal functionality and utilization of the space. In the kitchen the refrigerator, stove and sink should be laid out in relation to one another, and it should be seamless and easy to move from one to the other. A Ormond Beach kitchen and bath designer will know how to work with a contractor and architect to plan the flow of the room to work best for your needs. Here are some related professionals and vendors to complement the work of kitchen & bath designers: Kitchen & Bath Fixtures, Appliances, Tile, Stone & Countertops, Cabinets & Cabinetry, Woodworkers & Carpenters. Before you talk to bath and kitchen designers in Ormond Beach, FL, consider how you will use the room. For your bathroom, is it necessary to have a bathtub for bathing kids or pets, or would a shower suffice? Perhaps all you need is a half bath for downstairs or a smaller guest bath for occasional use. Similarly, for kitchen renovations consider your cooking habits. Do you eat out every night but need a space to entertain in? If so, a smaller kitchen might be fine for you, with a space devoted to wine storage or a bar, whereas others might prefer a bigger stove or extra cabinets. When interviewing Ormond Beach kitchen and bath designers, make sure to share these habits so they can best fit the room to suit your needs. Find an Ormond Beach kitchen designer or bathroom designer on Houzz. Narrow your search in the Professionals section of the website to Ormond Beach, FL kitchen and bath designers. You can also look through photos in Ormond Beach, FL to find a kitchen or bathroom you like, then contact the professional who designed it.